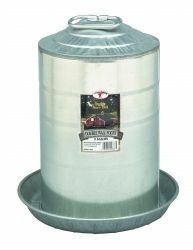 A heavy-duty standalone waterer for chickens, turkeys, and other poultry. Double-wall construction features an inner tube with a strong arched handle for carrying the filled fount and an outer tube with its own handle for convenience. When the outer tube is inserted over the inner tube, a copper spring and neoprene seal create a vacuum to maintain a constant water level in the drinking pan. Features a locking pin to hold the outer tube in place. Sloped top prevents roosting. Constructed of heavy-gauge galvanized steel with rolled edges for safety. Seams are constructed and tested to prevent leaks. A key advantage of metal founts is the ability to use the fount in winter with a heater base such as the Little Giant Electric Water Heater Base (Item No. HB125, sold separately). This is not a hanging water; must be placed on the ground or floor. 12.25 inch diameter by 15 inch high, holds 3 gallons.